The Royal Canadian Regiment was the only Permanent Force infantry unit in Canada when war broke out in 1914. Shortly thereafter they were shipped to Bermuda to replace the British garrison. They arrived in France in October of 1915 and joined the 7th Canadian Infantry Brigade of the 3rd Canadian Division. Also In the 7th Brigade were the 49th (Edmonton) Battalion, 42nd Canadian Infantry Battalion (Royal Highland Regiment of Canada), and Princess Patricia’s Canadian Light Infantry (which I have yet to paint). 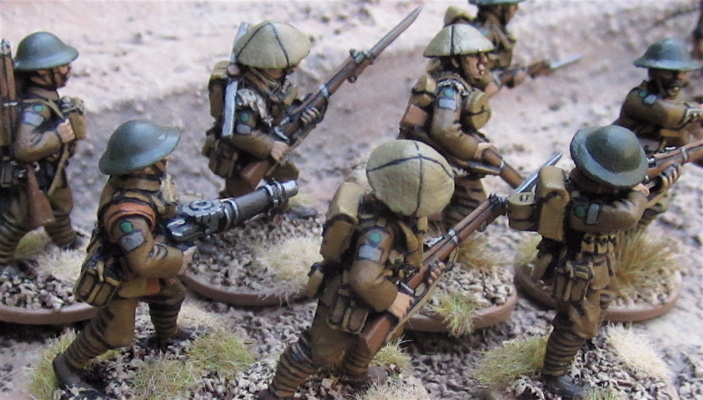 These, as with all the figures in the 7th Brigade, are from Great War Miniatures. The Royal Canadian Regiment – ready for action at Vimy Ridge. Detail of the Royal Canadian Regiment – the grey rectangle of the Third Canadian Division surmounted by a green circle – green for the senior brigade in the division, circle for the senior battalion in the brigade. I’m already working on Princess Patricia’s Canadian Light Infantry – to finish off the 7th Canadian Infantry Brigade… hopefully I will have them up by weekend’s end. Then it will be on to the 9th Brigade - which has three more battalions to finish up , and then I will be finished the entire 3rd division! They look great, love the Lewis gunner, are you doing any snipers with the Canadian rifle that the force was originally armed with? I'm not sure anyone out there specifically makes any figures armed with the Ross Rifle. I do have a sniper figure - from Great War Miniatures - and his rifle is wrapped in cloth for camouflage, so I suppose I could say it's a Ross Rifle...? No. I meant the RCR motto. Had a lot of association with the RCR over the years. Thanks! I do love Great War Miniatures - they are beautiful figures.